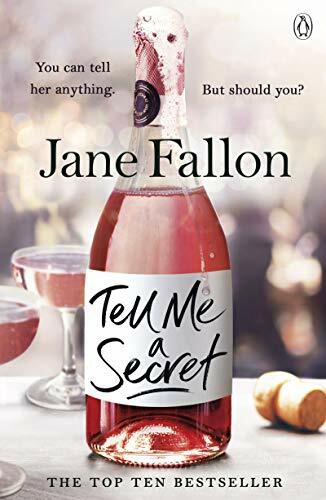 Wonderful news as Jane Fallon reveals her book for 2019, called ‘Tell Me A Secret’. Best friends Holly and Roz tell each other everything. Until Holly gets a surprise shot at her dream job. Why isn’t Roz popping the champagne? Now Holly feels like she’s got a target on her back. This is definitely one book that is going to the top of my TBR pile! You can pre-order Tell Me A Secret from Amazon and will be available to buy from good bookshops from 10th January 2019. ‘Faking Friends’ is Jane Fallon’s latest book. Amy thought she knew who Melissa was – then again, Amy also thought she was on the verge of the wedding of her dreams to her long-distance fiancé.When her career suddenly begins to unravel, Amy pays a surprise trip home to London. Her boyfriend Jack is out, but it looks like another woman has been making herself at home. And that Other Woman is Melissa. Amy has lost her job, her fiancé, her best friend and her home in one disastrous weekend – but instead of falling apart she’s determined to get her own back.Piecing her life back together won’t be half as fun as dismantling theirs, after all. In this book, we meet Amy, a successful actress in New York, whose career suddenly comes to an end and she finds herself returning to London with her tail between her legs. She’s looking forward to seeing her fiancé Jack as they have spent so much time apart with her busy career but she gets the shock of her life when she discovers that whilst she’s been away, her best friend Mel has moved in on her life with her fiancé. Amy is now in limbo, no job and no fiancé, she’s determined to move on but isn’t going to let onto either of them that she knows about their affair, instead she decides to play games with them instead and this really makes for entertaining reading. Amy is a great character, she’s strong and driven and refuses to go down without a fight, gradually moving her life into a small grotty flat that she now calls home. But with the help of her friend Kat, a woman she wasn’t as close to as she was to Mel, Amy begins to create a new life for herself and even meets a handsome new man. In Jane’s witty style of writing, the story is also seen through the narrative of Mel and this for me makes for delicious reading. Mel, is self absorbed, opinionated and also self entitled. She rarely sees herself as doing anything wrong and blames others for her own failures. She’s jealous of Amy’s life, as she always wanted to be the actress and we see that from the flashbacks that are scattered throughout the story. 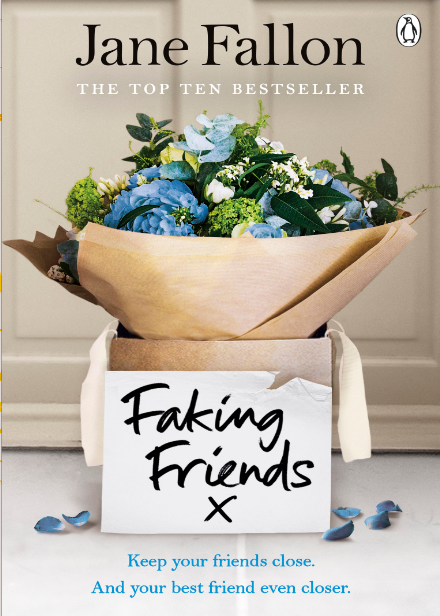 Deliciously funny and captivating from the start, ‘Faking Friends’ is a cleverly written tale about the complexities of female relationships and starting over. I loved it. You can pre-order Faking Friends from Amazon and will be available to buy from good bookshops from 11th January 2018. I’m delighted to see that Jane Fallon is back with a delicious new book called ‘Faking Friends’. Amy thought she knew who Melissa was – then again, Amy also thought she was on the verge of the wedding of her dreams to her long-distance fiancé. When her career suddenly begins to unravel, Amy pays a surprise trip home to London. Her boyfriend Jack is out, but it looks like another woman has been making herself at home . . .
And that Other Woman is Melissa. Amy has lost her job, her fiancé, her best friend and her home in one disastrous weekend – but instead of falling apart she’s determined to get her own back. Piecing her life back together won’t be half as fun as dismantling theirs, after all. After loving Jane’s last book, ‘My Sweet Revenge’, I’m on the countdown to ‘Faking Friends’. 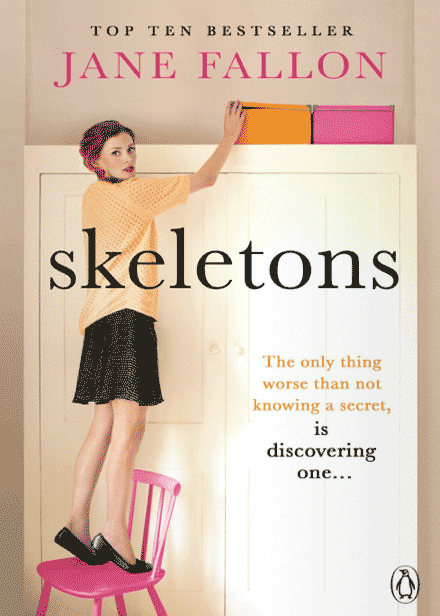 ‘Skeletons’ is the latest book by Jane Fallon. Since she was a little girl Jen always wanted a big happy family. Being an only with just her lonely mother for company was too gloomy for Jen. So when she married Jason and became part of the Masterson clan – a family that could easily have appeared in an Enid Blyton novel – she got exactly what she wanted. For years everything was perfect. But then Jen sees something that she was never meant to see: a scratch on the gloss of her perfect life; a secret that will slowly but surely seep its way to the surface of her world and destroy everything in it. If she keeps this dirty little secret to herself, how long can she pretend nothing is wrong ? How long can she live a lie? The story is primarily seen through the narrative of Jen, a woman who is living the perfect life, happily married to Jason with two daughters, she enjoys her job as a reception manager and looks forward to her weekends away with her husband’s family, an accepting family that she immediately fell in love with. Having grown up in empty house with only herself and her mother, she relishes the hustle and welcoming arms of Jason’s family. For years Jen lived a lonely life, a life that I can sadly relate to, as an only child and my parents separated, I almost felt like Jane had based Jen on myself although I was quite content with my books! Jen’s relationship with her mother is quite strained, as Jen regularly questions about her father and her mother refuses to get into conversation much to Jen’s frustration as she wonders why one day her father just up and left, so with no proper explanation, Jen is just left to assume that she was never good for her fathers attention. So when she meets Jason, with his huge loving and welcoming family, Jen is delighted to step into the family that she has always longed for. Amelia, the mother of the family, is a kind lady who takes Jen under her wing and provides Jen with the mother that she has always wanted, caring, attentive and always there to listen and Charles, the father a humorous character and well respected pillar of the community whereas Jason’s sisters Poppy and Jessie present Jen with siblings and new best friends. But sadly one day when Jen goes out on her lunch break, she witnesses something that will tear the loving family apart. It seems that the perfect family Jen has settled into comfortably has been living a lie and now that lie has been discovered it wants to be brought to the surface and expose it’s ugly truth with or without Jen’s help. But Jen is stuck between a rock and a hard place, does she tell the truth and risk losing it all or does she leave the skeleton in the closet. Typical of Jane’s previous books, ‘Skeleton’s is a book that is a captivating story, dark and witty with a strong cast. Jen in particular is interesting, in love with a family but once she sees something, it seems that she has removed the rose tainted glasses and every flaw and everything she made allowances suddenly changes her opinion and everything is not so perfect. Realising the life she had become part of is all a lie, Jen battles with her conscious whether to tell the truth or just to leave it well alone. A story of morals, secrets and living a lie, ‘Skeletons’ is Jane Fallon at her best, an edgy, gritty and unpredictable story that leaves you cynical of happy families. A welcome return to one of my favourite authors. You can buy Skeletons from Amazon and is available to buy from good bookshops. Having read all of Jane’s books, I must admit I am quite looking forward to this book, as it sounds like quite an interesting story. Jen has discovered a secret. It’s not hers to share, but is it hers to keep? If she tells her husband Jason, he might get over the shock but will he forgive her for telling the truth? She might drive a wedge through their marriage. If she tells someone else in Jason’s family – the family she’s come to love more than her own – she’d not only tear them apart but could also find herself on the outside: she’s never really been one of them, after all. But if she keeps this dirty little secret to herself, how long can she pretend nothing is wrong? How long can she live a lie? Jen knows the truth – but is she ready for the consequences? With such an intriguing synopsis and a playfully bright cover, ‘Skeletons’ definitely sounds like an interesting tale. You can pre-order Skeletonsand will be available to buy from good bookshop from 27th March 2014.